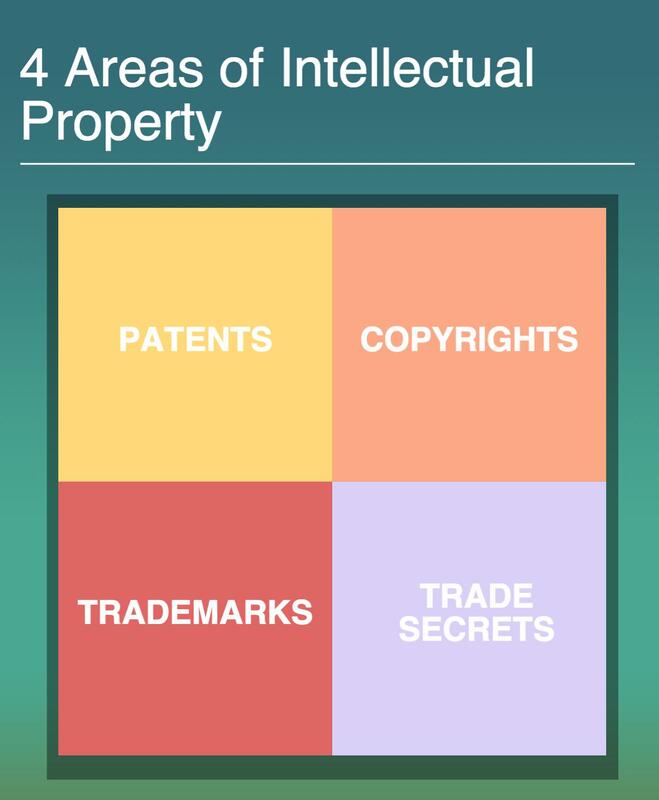 Learn about the 4 main areas of IP: Patents, Copyrights, Trademarks, and Trade Secrets. This guide also covers the patent application timeline, how to know if a copyright infringement is fair use, whether you should register your trademark, and the definition of a trade secret. Intellectual Property (IP) is a legal term that refers to products of the mind. Intellectual property laws grant intellectual property owners a set of exclusive rights. The law views intellectual property rights as a form of property, commonly referred to as intangible property. The most common types of intellectual property rights are copyrights, patents, trademarks, and trade secrets. Examples of works that can have intellectual property rights include music, literature, artistic works, discoveries, inventions, words, phrases, symbols, and designs. Patents are granted by the United States Patent and Trademark Office (USPTO) through the patent application process. They give an inventor the exclusive right to make, use, or offer for sale their invention for a limited period of time. In order to file for a patent, the inventor must make a detailed public disclosure of the invention. Patents filed after June 8, 1995 are granted for a period of 20 years. All inventors are strongly advised to do a patent search on their invention prior to investing significant time and resources. A copyright grants the creator of an original work the exclusive right to use and distribute it. Copyrights do not protect the actual idea, they only protect the artistic work used to express the idea. Copyrights are typically available to a wide range of artistic works, including: poems, theses, plays, literary works, motion pictures, choreography, musical compositions, sound recordings, paintings, drawings, sculptures, photographs, computer software, radio and television broadcasts, and industrial designs. A industrial design right protects the visual design of objects that are not exclusively utilitarian. An industrial design encompasses the shape, configuration, composition of pattern or color in a three-dimensional form containing aesthetic value. Industrial design rights are known as design patents in the United States. Atrademark is a recognizable sign, design, or expression which identifies products or services as being from a particular source. An individual, a business, or any legal entity can own a trademark. Trademarks can be registered with the USPTO and must be renewed every 10 years. Trade dress is a legal term that refers to elements of the visual appearance of a product or a product’s packaging that signal the source of the product to consumers. A trade secret is confidential business information that gives one business a competitive edge over competitors or customers. A trade secret can be a formula, practice, process, design, instrument, pattern, or compilation of information. Violation of intellectual property rights are called “infringement” with respect to patents, copyright, and trade secrets. “Misappropriation” is the used when referring to violation of trade secret rights. Violation of these rights can either be a breach of civil or criminal law, depending on the type of IP involved, the jurisdiction, and the nature of the violation.